1920 Colorado Ave, Santa Monica, California. Pacific Gravity Alum Drew Pomatti works at the brewery. Start time will be about 7:30. Hope to see you there! Don’t miss our first club meeting of 2019, headed by our new president, Ian Fraser. Where: Tortugo Brewing, 916 W Hyde Park Blvd, Inglewood, CA. Homebrew Style of the Month: English Bitters. Please bring some home-brewed beer to share. Pacific Gravity’s first “First Friday” of 2019 is moving to SATURDAY for January. Please join us on Saturday January 5 as we travel to Long Beach to check out Martin Svab’s new venture; The 4th Horseman, located at 121 W 4th St, Long Beach, CA 90802. We will be hosted by Martin and Ryan, who have 12 beers on tap and over 50 more in bottles to choose from plus some righteous good pizza! I have been told they will put some epic beers on for us and club member Martin will be in attendance! All Pacific Gravity members who show up will also receive a club discount on your purchases! So start the New Year off right with some good pizza and beer. We’ll be starting at 12 noon. Where: Smog City Brewing Company, 1901 Del Amo Blvd, Torrance, CA. EDUCATION HIGHLIGHT: In the first of a series, Carl will be demonstrating how water chemistry affects the taste of your homebrew, and how you can fine tune your H2O to the style you are brewing. COMMERCIAL STYLE of the MONTH: IPAs, hosted by Reuben. And whatever Porter Has On Tap. HOMEBREW STYLE of the MONTH: Your Monster Brew, and any home-brewed IPA. Kegs, bottles and growlers of the style of the month are encouraged. All homebrews are welcome. 36 PG and WASH (West Adams Society of Homebrewers) members attended the annual Southern California Homebrewers Festival at Vail Lake in Temecula. We shared 23 kegs with home brewers from around Southern and Central California. We held our last meeting at PG’s long time home, Culver City Homebrew Supply. Our annual Big Brew highlighted the different methods used to make award winning (and tasty) beers, from Michael’s Brew-in-a-Bag, to Carl’s Thermo-Siphon Reboiler, to Parker’s Set-it-and-Forget-It Grainfather. PG members congregated at the Casa Molloy Event Center to make jockey boxes and add to our auxiliary stock of party taps. Another cozy Summer Party involving much sampling of fellow PG members home-brews, interesting commercial beers from around the country, and the culinary inspirations of Ian Fraser and his Merry Band of Sous Chefs. Our combined August club meeting / Tania’s Birthday Party was held at Neil Saund’s duplex. And finally, a Labor Day Weekend Downtown-LA Brewery Crawl. To kickoff the crawl, Art District’s Head Brewer Devon Randall bought everyone’s first pint, and her staff treated us to a tour of the brewhouse. We also sampled their freshest beer. Now, let’s kick our Fall into high gear. Phantom Carriage was started by a couple of Pacific Gravity alumni. Tortugo is only a couple of months old, and was started by PG member Joe Kovach. He has some pretty tasty beers on tap, including a Belgian Wit that is right on the mark. Hyde Park Blvd is about 2 blocks East of the intersection of Florence and La Cienega, and about 4 blocks East of Three Weavers. After many years of outstanding service, Tim Bardet is retiring as Treasurer. At the September and October meetings, we will be taking nominations for Treasurer, and – if you are so inclined – the other elected positions (President, Vice President). 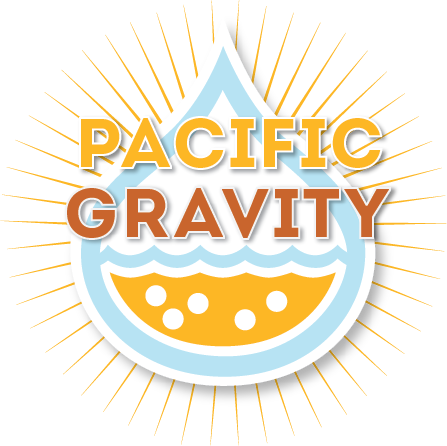 If you would like to be part of Keeping Pacific Gravity Great, please volunteer your nomination. We haven’t worked out all the details yet, but just wanted you to be ready for it. Remember: Please bring some of your homebrew to the meeting and events. What do you do when First Friday has too many options? Push it to Saturday, of course! Join us for a visit to several of the downtown area breweries. It also give many of a us an opportunity to take public transit. Greetings All, I am posting on behalf of Carl Townsend our ‘cat herder’ and organizer of our Saturday Arts District Pub Crawl. Arts District Brewing from 12:00 Noon to about 1:30 PM or so. Then if you are super serious about hitting all the stops you can finish at Weiland Brewing or Boomtown Brewing both located right in the neighborhood! Post any comments or questions in the comments section and we will get back to you! If you want an early start, I’d suggesting grabbing a bite to eat at Wurstkuche, 800 E. 3rd st @ Traction Los Angeles, CA 90013 . This place has has a variety of German sausages and a good assortment of German and Belgians beers. Wurstekuche opens at 11AM. From there, we have several directions we can go. Due south of Arts District is Iron Triangle Brewing, 1581 Industrial St, Los Angeles, CA 90021. 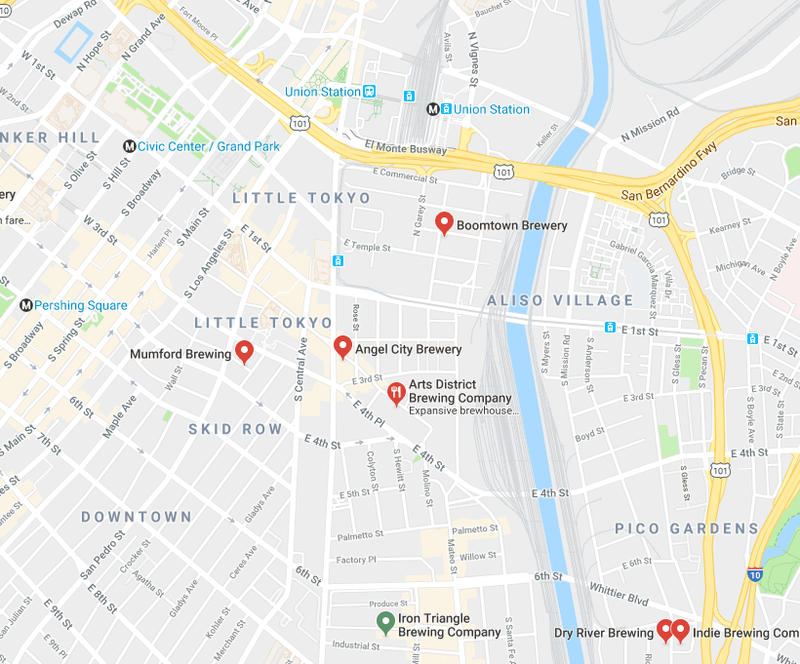 To the east, across the 6th Street/Wittier bridge are a pair of breweries, Dry River Brewing, 671 S Anderson St, Los Angeles, CA 90023 and Indie Brewing Company, 2350 Sunrise St, Los Angeles, CA 90023. At the north end of Arts District is Boomtown Brewery, 700 Jackson St, Los Angeles, CA 90012. This is the closest brewery to Union Station Red and Purple lines, and the Gold line. At the west end of the area is Mumford Brewery, 416 Boyd St, Los Angeles, CA 90013. There are a number of different options to get to the Arts District by transit. You can take the Expo line up to the 7th Street Metro center. You can grab the Red line there for a one or two stops to save a bit of walking. Fare is $1.75 each way. This Friday (April 6) is First Friday! WE NEED BEER! If you have a keg you can share with a thousand or so of your fellow brewers from around Central and Southern California, please email me at brewfest @ pacifgravity.com. Advise with style and keg size. You name will be prominently displayed on our tap list at the fest. … on a yet-to-be-determined Saturday in June. We’ll be taking orders for supplies (stainless tubing, vinyl tubing, keg fittings, taps) at the next club meeting (April 19). You supply the cooler. More details to follow in the pre-meeting post in a couple of weeks. March is dues month: $36 per individual, $54 for couples. This Friday (March 2) is First Friday! This Saturday (March 3) is Monster Brew Saturday! Don’t miss out on a chance to see a 15-barrel batch of beer brewed up close, taste some of Jon Porter’s excellent creations, and take home your own 5-gallon batch to modify as you see fit. See 2018 Monster Brew for more details. We still have some camping slots available. See Southern California Homebrew Festival for details. SUPPORT YOUR LOCAL HOMEBREW SUPPLY SHOP! February’s PG First Friday is almost here. Please join us on Friday February 2 at Smog City Brewing. We’ll get started at the usual 7pm, so come on down and see what Jon Porter & Co have on tap. Smog City has long been a strong supporter of Pacific Gravity. A visit to their taproom with the PG gang is a great way to return the favor. Hope to see you there. January’s First Friday is actually a First Saturday homebrew share at Rob Ruben’s, 909 E. El Segundo Blvd, El Segundo starting at 3pm (changed from original 1pm). We’ll be cooking up some burgers and brats while sampling Rob’s beers / spirits and sharing our brews with Rob and his staff. Please bring some homebrew to share. Bottles, growlers and kegs are welcome. If you plan to attend, please email me at [email protected]. Rob would like a headcount for planning purposes, and it will help us with food planning, too.